On Dec. 18, 2018, a large "fireball—the term used for exceptionally bright meteors that are visible over a wide area—exploded about 16 miles (26 kilometers) above the Bering Sea. The explosion unleashed an estimated 173 kilotons of energy, or more than 10 times the energy of the atomic bomb blast over Hiroshima during World War II. Two NASA instruments aboard the Terra satellite captured images of the remnants of the large meteor. The image sequence shows views from five of nine cameras on the Multi-angle Imaging SpectroRadiometer (MISR) instrument taken at 23:55 Coordinated Universal Time (UTC), a few minutes after the event. 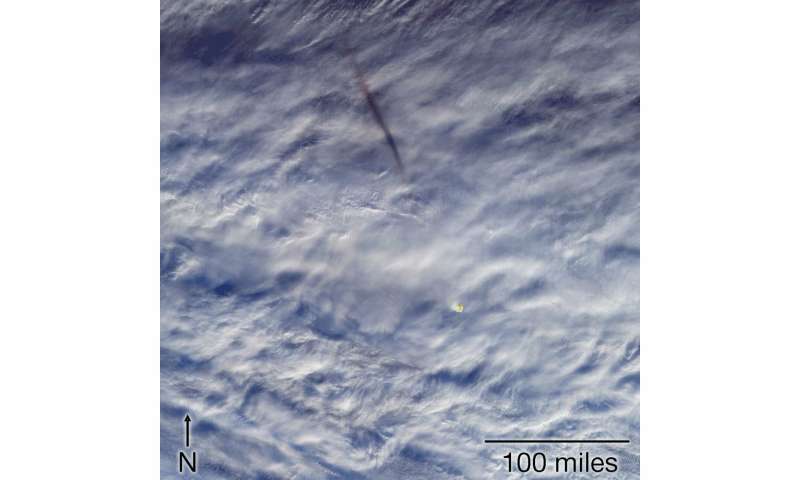 The shadow of the meteor's trail through Earth's atmosphere, cast on the cloud tops and elongated by the low sun angle, is to the northwest. The orange-tinted cloud that the fireball left behind by super-heating the air it passed through can be seen below and to the right of the GIF's center. 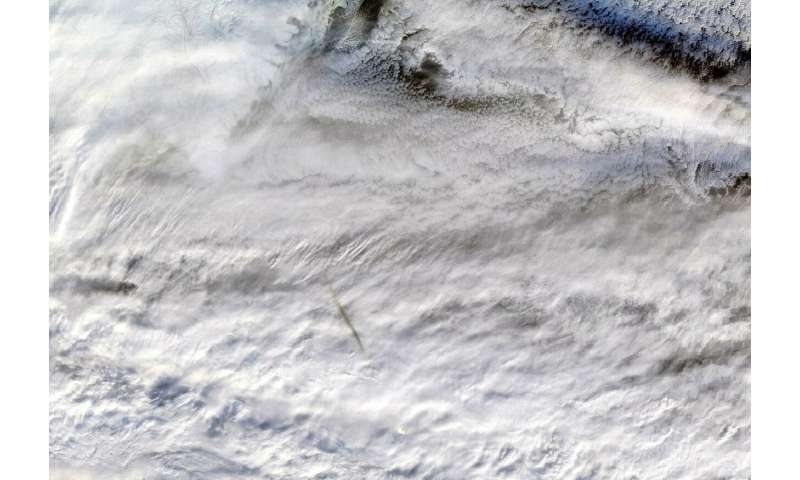 The still image, captured by the Moderate Resolution Imaging SpectroRadiometer (MODIS) instrument, is a true-color image showing the remnants of the meteor's passage, seen as a dark shadow cast on thick, white clouds. MODIS captured the image at 23:50 UTC. The Dec. 18 fireball was the most powerful meteor to be observed since 2013; however, given its altitude and the remote area over which it occurred, the object posed no threat to anyone on the ground. Fireball events are actually fairly common and are recorded in the NASA Center for Near Earth Object Studies database. The Terra spacecraft was launched in 1999 and is managed by NASA's Goddard Space Flight Center in Greenbelt, Maryland.